I’m still refinishing gun parts, making live edged projects, and wanted to come up with something easy and quick for an inexpensive small sale item at the Golden Hobby Shop in German Village. 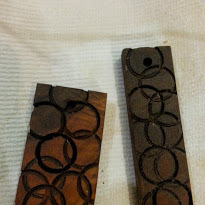 So these are very small scraps of walnut, worked on the drill press, and dipped in linseed oil (one coat so far, they’ll get a second, and then buffed). 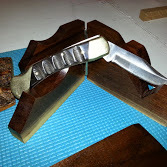 Each will get a manly charm of some kind–interesting washer or grommet or bearings–and a key chain, and then VOILA, will put them onto the stand I’m making this weekend. 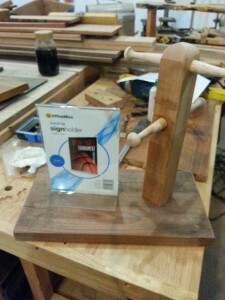 There’s still a knob to attach to the top of the stand, and coating it, and making the little card to go in the signholder, and screw down the signholder . . . never ends . . . 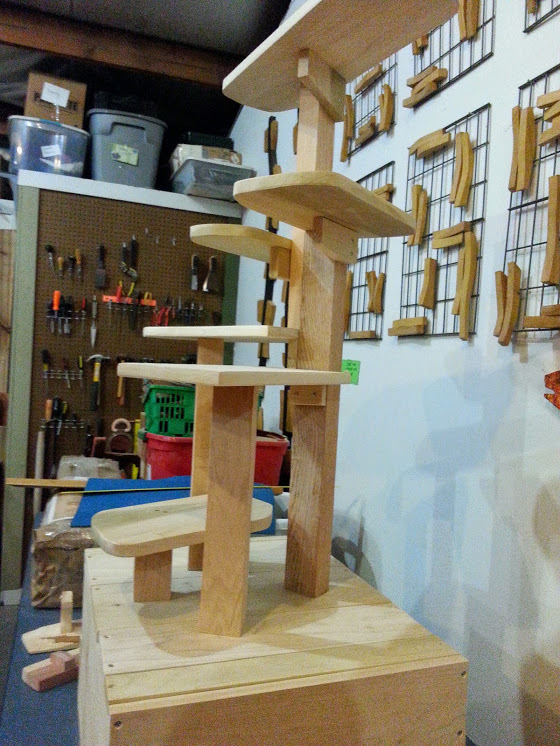 Lately I’ve been growing in my woodworking skills, some self-taught from videos and books, some with the kindness of members of my woodworking guild stopping by or emailing with information. 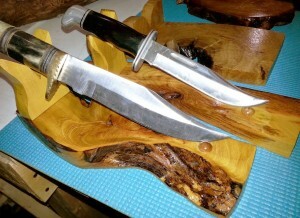 I’ve taken on making these knife stands for two local shops and a businessman who travels to gun shows with his products. That was a matching job on the finish, to the existing grip–pretty darn close! And next, making display boxes for knives and guns, gun racks, and boxes for sharpening stones. The goal is to make the studio pay all it’s expenses even when I don’t have a gallery show to put together, and every project grows my skills towards that goal. Love making these. Each one is different due to the wood itself, they are heavy and textured and unique, qualities I really like! 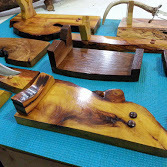 October 8–cut out thirty cedar flat knife stands and 6 folding ash wood stands, going to sand them the 9th and have them done by next week. Shop smells wonderful. 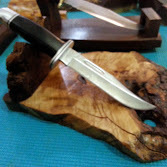 and yesterday the owner asked if I could provide them with wood for knifemakers to use for handles. 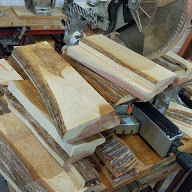 Did that research on size and price this morning on ebay and etsy, and while I’m flipping through the lumber today with Dave the Planer Dude, I’ll set aside some nice pieces and tomorrow, cut bookmatched pairs and post a pic of those for you.